Grading, like so much in our educational system, is long overdue for an overhaul. Just in my lifetime, the grading systems of the early 80’s are the same ones we employ on a day to day basis today. While it serves a purpose, it really doesn’t co-exist very nicely with the ideas of individualized or personalized learning, differentiation, and teaching the whole child. Grading simply can’t be the only means by which we provide feedback to students, and while there are a variety of ways to give deeper and more specific feedback, I personally think giving badges is a practice worth exploring. Think about those students you have taught in your days as a teacher. Think about the varying skills, interests, and abilities they brought in each and every day. Now think about evaluating those varying attributes using the same exact set of expectations each and every day. What might happen if we looked at daily feedback as a way to engage the core of a child in an effort to bring out the best they have to offer, not just an understanding of math facts? What I love about they idea of badging is that it is so continually open. Grading is closed. We give a test, we score a test, we record the grade, and we return the test. More often than not, that is where the door closes. You were either successful, or you were not. Badging allows you to identify the elements of that make the child a strong learner, and while you can certainly provide instructional, you can additionally award badges for skills, interests, and non-instructional abilities. Imagine you could tell every kid in your class that you saw much more than a spelling grade. Imagine you show each child you see them for far more than a letter or number grade. Awarding badges can be done in a variety of ways, but when using a learning management system, you can not only award the badges throughout the year, but keep a running record of the growth and strengths each child possesses. 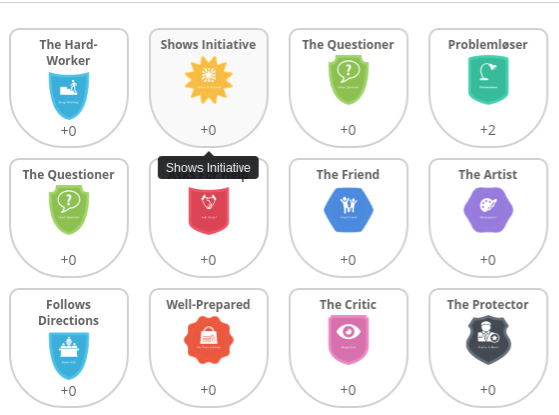 I personally love Classflow for awarding badges. In the middle of a lesson delivery, I can look out at a student who is struggling, award them a perseverance badge, and open the door rather than shutting it. I can identify the student might not understand the math problem, but has some great artistic skills, and in time find a way to bridge the two. Drawing math problems might be solution to engagement, all because you build that confidence in other ways. I can award one student a badge, multiple students, or the whole group. I have the ability to create my own badges if I choose, and make it truly meaningful to my classroom culture. The opportunities are endless! Have you tried badging? Are you considering it? I would love to hear your experiences. 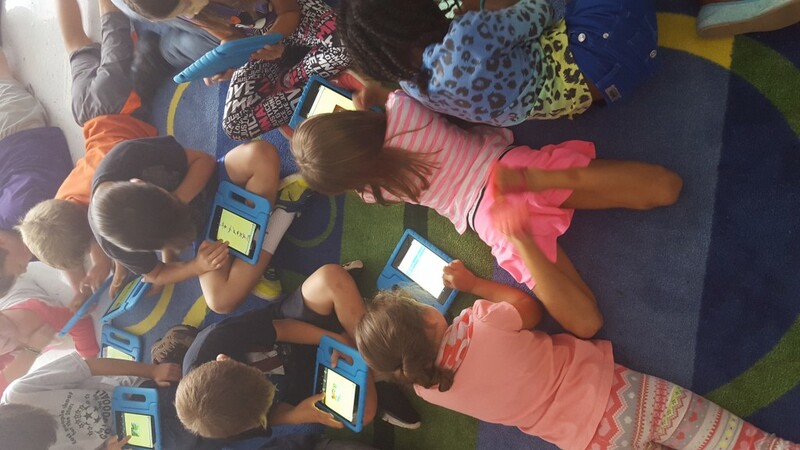 Learning together is always better! During this time of the school year, we immerse ourselves back into the classroom and embrace starting over again. With that, digital citizenship becomes incredibly important to teach as we pull out those Chromebooks and get started learning and sharing. Common Sense Education certainly has helped us get a great start on kicking off the year, and keeping it going, but what happens when you are ready to move on and teach new things and integrate more tools? I suggest you bring it all together… and here are a few ideas on how! 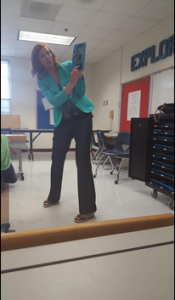 I kicked off the year using the Digital Life 101 video with students in grades 2-5. It started such a great conversation on how none of the technology practices are bad, rather we were able to talk about the human element and how that is what makes technology look bad. I loved helping them connect the dots on how actions shape how technology is represented. With this being our 3rd year together, one of the things I really wanted to see in our second week, was how much prior knowledge my students in grades 4 & 5 had. I whipped up a Classflow lesson with a few question sets that focused on responsible sharing, privacy, and online voice. I loved delivering that lesson and seeing my students perform WAY better than I ever imagined. It was great to see that teaching #digcit every year consistently pays off! If you want to check out the question sets I created, you can grab it from the Classflow Marketplace here! 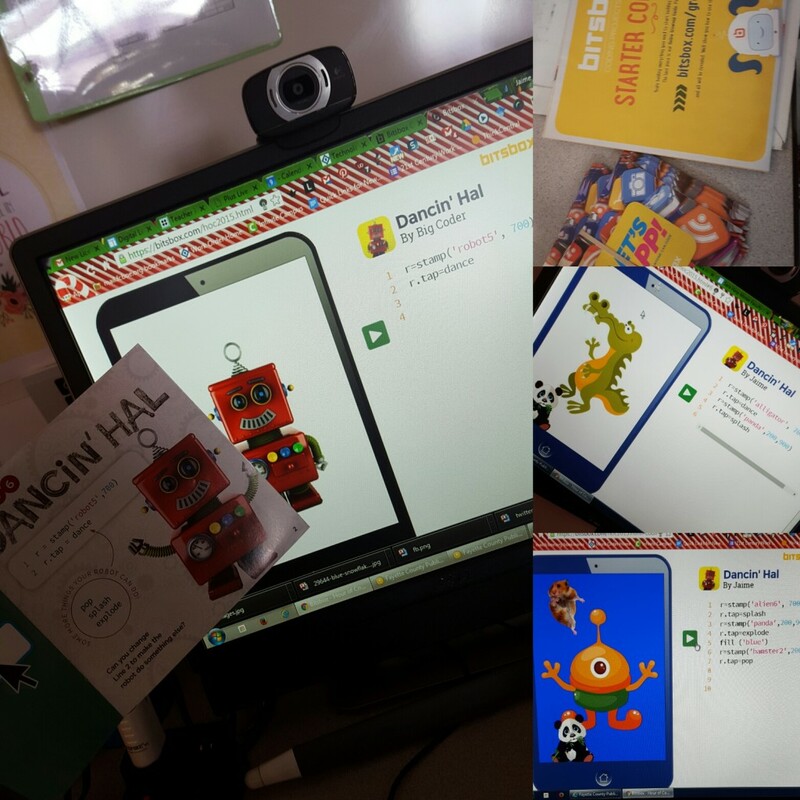 In 3rd grade I have loved building great conversations around #digcit through Digital Passport and Storybird. This gave my students a game based learning experience, as well as a creative outlet for sharing what they knew about being safe and responsible online. So you see, #DigCit isn’t just a lesson, or an activity. It is a continual conversation, an ongoing vision, and a culture. It can be taught in so many ways. 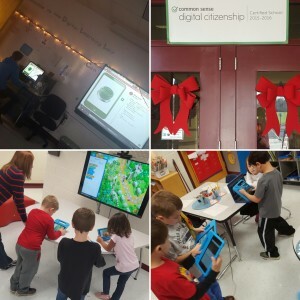 Do you have other ways to teach digital citizenship? If so, share in the comments! Growing is something that I have become quite accustomed to in this instructional technology career of mine. I know as a teacher I did similar things each year, but I feel like in this role the growth jumps are so much bigger, better, and eye opening. 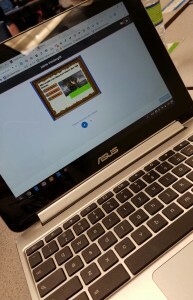 In our Meet the Teacher event two weeks ago, I had a student come back, who is now in 7th grade, and in talking to her she mentioned how she thought it was cool that her class was the first I had used Google Classroom with. It was a conversation that left me thinking about how far I have come in just two short years in terms of instructional technology and learning tools. I have used so many tools, I sometimes look back and wonder how I kept them all going in the craziness of the year. This year I do believe it is going to be quite different. This year I found Classflow! Last spring Classflow hit my radar at the Google Apps for Education Southern Summit, and since then I have been quite intrigued with just what potential lies in this content management system. I was thrilled to jump in and start learning about how Classflow worked, and what place it might just have in my instructional planning. I had no idea how far this would go, but now I sure am glad I started exploring! Classflow combines so many of the tools I already use into one FREE classroom content management program. 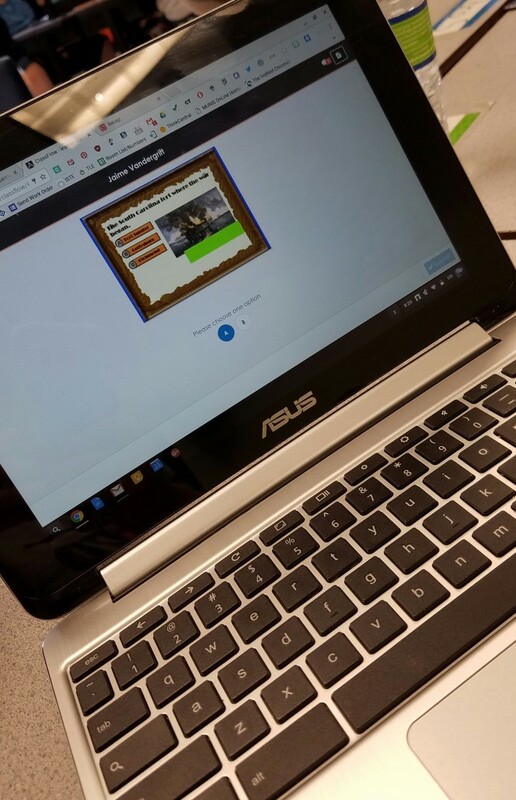 It lets me search thousands of already created interactive resources, run lessons, assign tasks, award badges, deliver content that students can connect to, and provides me opportunities to send live questions straight to student devices. I can send a question to all students, or just a select group. I have a class stream for sharing announcements with each class, and I can even run Classflow Desktop on the fly with any web based lesson with full annotation tools! This really is only the tip of the iceberg in terms of how Classflow can impact the teaching and learning in my room… and my school! I personally think I have gained such a better understanding of Classflow because I have jumped in to it from three different perspectives. I have looked at it from the role of a teacher, a student, and an Instructional Technology Specialist. Those different perspectives have given me a deeper appreciation for what I can do to change teaching and learning in my building and beyond though using Classflow! So where do you start? 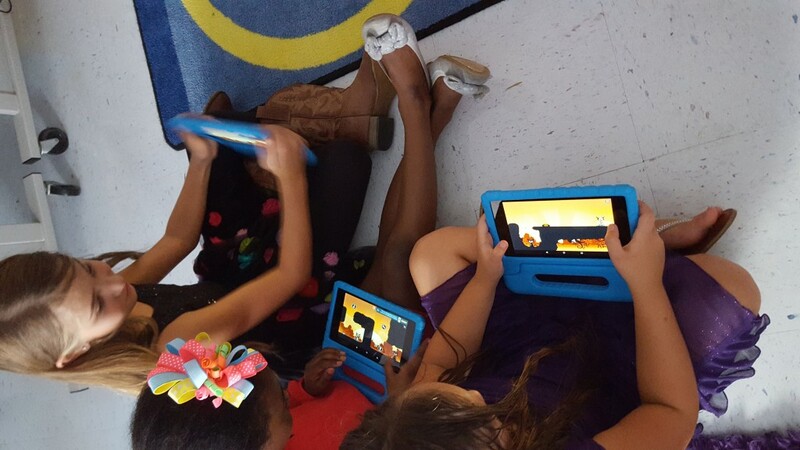 I suggest you check out Camp Classflow as a great starter resource. Head back to school with a new Classflow account and be ready to wow your students, parents, and fellow teachers! Kick off the year with something that is going to make a difference in how you teach your class each daily! Hang on tight as this blog is going to be a multi-media production. Text alone simply can’t convey the amazing things happening at Sara Harp Minter! This was the whole month of December! What a crazy fall it has been in our little part of the education world @saraharpminter. I truly believe it is imperative that we share the amazing things that happen in our schools, as the media sure can do a pretty good job showing the other side of it all. I don’t want to tell you about test scores… the media will tell you that. I don’t want to tell you about new initiatives, as what is the fun in that? I want to tell you about the great instructional gains that have happened in our school, as that is a great story to tell! 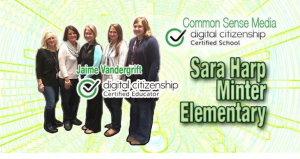 Let’s start with Common Sense Media, and our 6 week journey to becoming a Common Sense Media Certified School and my work in becoming a Common Sense Media Certified Educator. 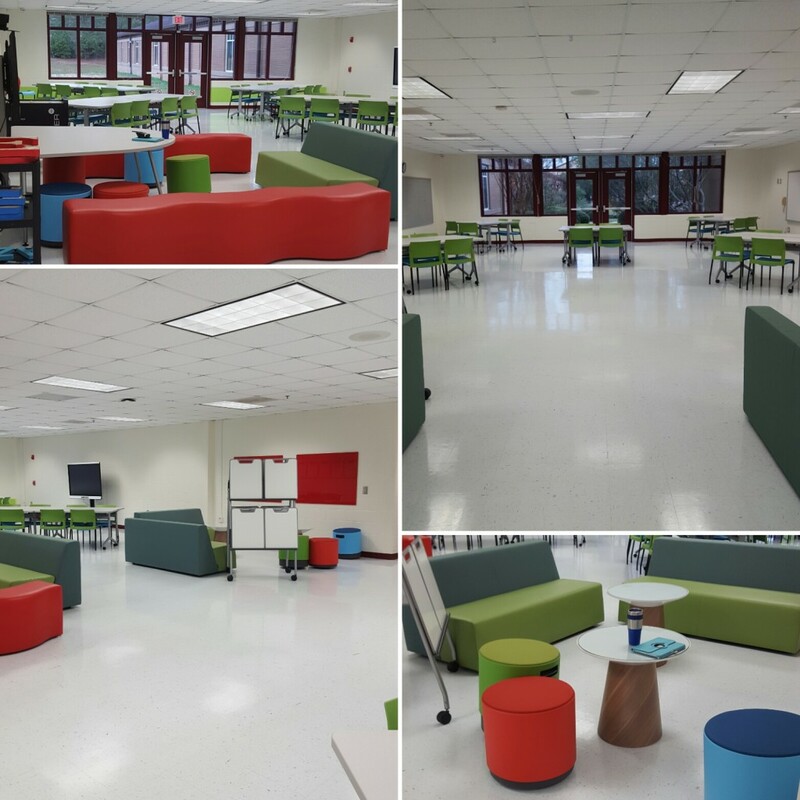 It took plenty of time, planning, instruction, and collaboration, but it was so very worth it. 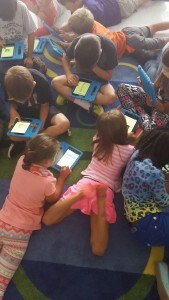 We started with grades 3-5 and used the great resources in Digital Passport to get the data we needed to have some great wrap around lessons in the weeks to follow. The honest conversations we had, the real situations we discussed, and the feedback we received was truly what made the whole experience come together. If you are considering taking this path and working toward this certification, I highly recommend it! I am also always willing to share how I did it. 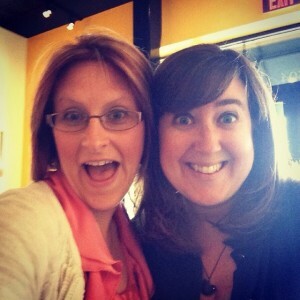 Find me on Voxer @jaimevanderg and I will share our Common Sense journey with you! This little journey was a trial run of virtual reality as a writing center in first grade. 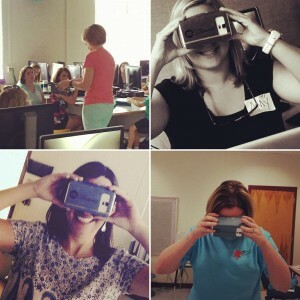 As those of us without Google Expeditions in our reach know, we have to get creative with how we use Google Cardboard and VR viewers in our instructional practices. For this group the students all had one opportunity before the writing center to take a walk in Virtual Reality Jurassic Land. They could see a T-Rex, and a couple of other dinosaurs running around, and were captivated that the Dinos ran right by them. We talked about looking for what habitat the Dinos lived in, and what they ate. It was the starting spot for the writing to come. 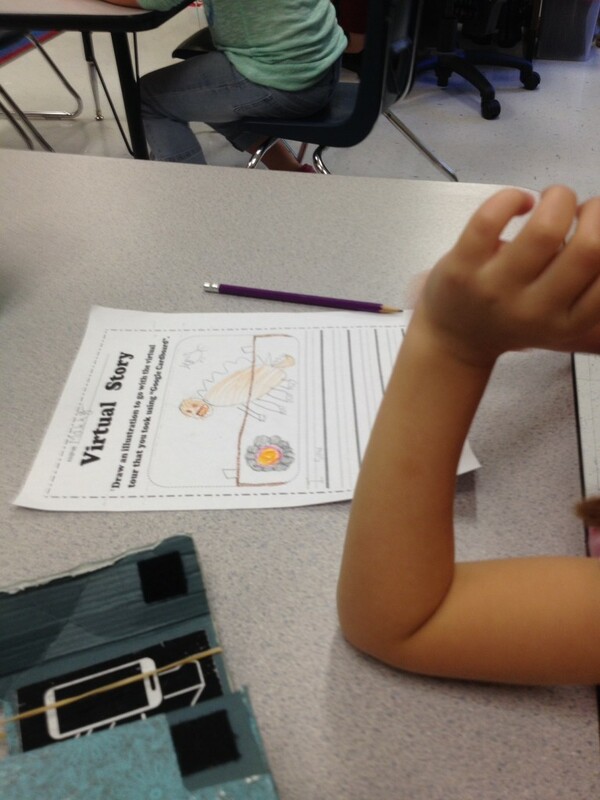 One of my amazing first grade teachers made a virtual story writing page, and students when in that center could re-view the Dinos, and then draw a picture and tell a story about their virtual journey. Each day for a week a new group had the opportunity to go virtual and tell all about it. This for me was a trial run. Here is what I learned. Cardboard won’t hold up in the hands of our little ones. 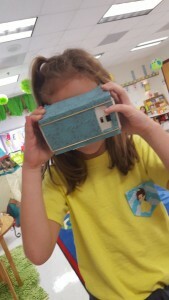 I bought a real viewer recently to give it a try in our other first grade classes. I also think that the viewer in our primary grades will be best served with an adult guiding the virtual journey and overseeing the use of the viewer. I see so much potential for this, and hope that in December we can get this into our other first grade classes too. What a great learning experience, and all it takes in some passion, drive, and some easily attainable resources. The devices inside are ones I had lying around the house. If you have some of those, why not turn those into virtual journeys for our kids? Lastly, I have been quite busy professionally as well. I am better to those I work with and for if I am always growing and learning, and that is just what I have done! First, I passed my Instructional Technology Certification Test in October, and I am elated! What a journey to have behind me. I have been asked if the EdS courses helped in preparing for the test, and I can easily say in fact they did! Then on a spur of the moment decision, I jumped on an email in my inbox about working toward becoming a Newsela Certified Educator. My school district has Newsela Pro, and I haven’t truly felt I could be supportive in helping my teachers learn how to use this Non-Fiction Gold Mine as an instructional tool. So off I went in meeting the requirements to become a Newsela Certified Educator. It was a great learning experience as well, and I am so glad I did it! I am so excited to share Newsela with my teachers, as well as anyone else who has an interest! Sharing is what it is all about! Where has the last 12 weeks gone? From pre-planning and un-boxing new Nexus 7’s, to starting the year off and hoping for the best, here we are headed into November! 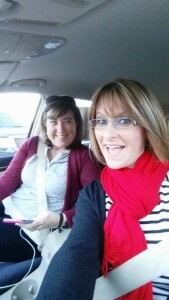 My original plan was to blog about our adventures each week. (Insert belly laughs here!) Clearly my estimation of “free time” was off just a bit! So here we are in the second nine weeks, and I have committed to documenting the journey, so I guess it might have to be just a grading period at a time. So here we go… The first 9 weeks of Tab Lab! Week 1: Tablet 101 & Paint App – (Communication ) I probably didn’t consider how different it would be to teach a 1:1 tablet lab from a 1:1 Chromebook or PC lab. 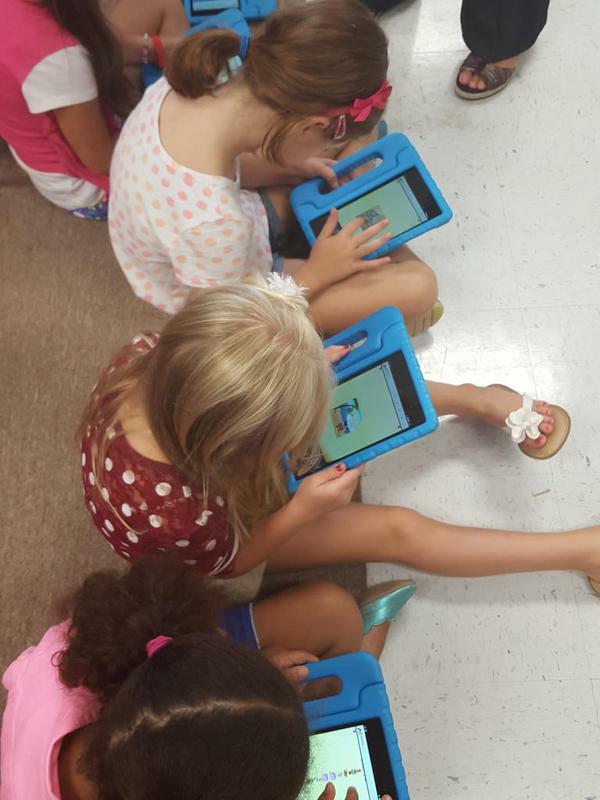 Tablets in 2nd grade were not new, yet the structure of a class sure was. 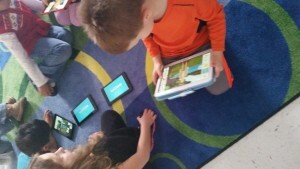 We role played the right and wrong ways to handle tablets, how we carried them, and what they needed to do once they got them. (Upside down in those laps!) We have a saying… when it is time to start we say “Flip Up, Wake Up, Swipe Up, Find Your App.) Now the first few times we also made them ‘put their apps on their heads’. This helped us to see they were in the right place and simply meant they raised tablets up for us to visually sweep the room quickly for a check of each tablet status. As for the instruction, we asked a series of 3-5 questions, and asked students to illustrate the answers. It was fun watching them illustrate ideas, and enjoy sharing them with others. Computer screens and wired set ups keep us from truly sharing our work with the group sometimes, so this was a nice welcome change! Week 2: Georgia Symbols Using Pic Collage – (Research and Information Fluency) In an effort to tie in some instructional connection, we helped our 2nd grade teachers by introducing some Georgia State Symbols through images with Pic Collage. We brainstormed search ideas (which I HIGHLY recommend due to content available on that app) and had students type or use voice -to- text those symbols into the search. They learned a lot, and so did we. As a WV girl, I didn’t know much about Georgia, so it was a learning win for us all! Week 3: Comic Creator – (Creativity) I always tend to lean toward ELA based learning practices, so this was a great way to help students spend more time on characters, settings, and sequence of a story. We talked about time order words, and using images to tell a story. They loved all the possible character and setting options, and it was so fun watching them create their own comic based stories! 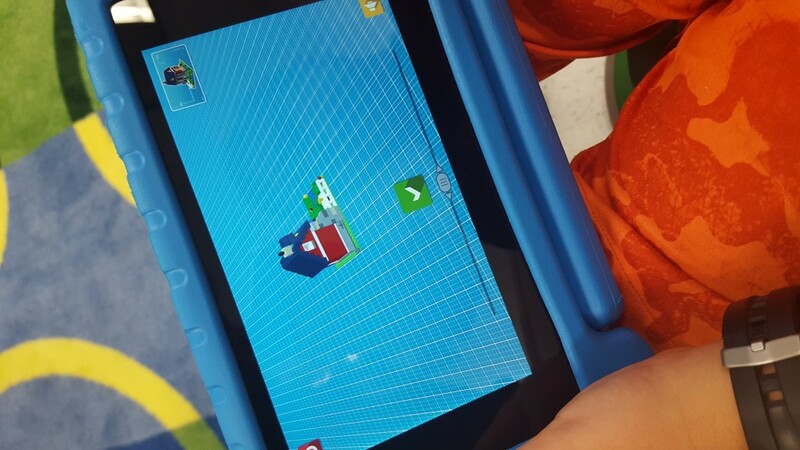 Week 4: The Foos – (Critical Thinking) Why wait until December to work with students on coding? This will be something we do every 9 weeks, and each time we will use a different app to facilitate the practice. I love that we have so many options to make coding a regular instructional plan for the Tablet Lab! Week 5: Cat Physics – This is what we call in Tab Lab as “Winner Winner Chicken Dinner” lesson planning! I won the lottery on this one. 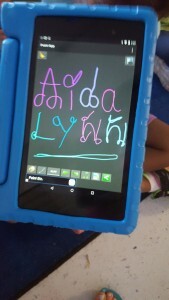 The 2nd graders were in love. So many of them went home and asked their parents to download the app too! Cat Physics was so much trial and error. It was angles, estimation, problem solving and planning. 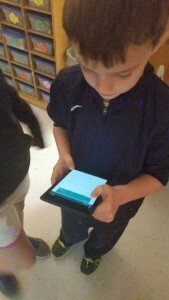 What was additionally great about this app was the discussion we heard from students. Each level increased in complexity, and watching 7 and 8 year-olds talk though strategies together, ask each other for help, and see them celebrate with each passing level, simply made me the happiest little teacher I could be! Week 8: Sprinkle and Sprinkle Island (Critical Thinking) – We needed to put out fires, and do it fast. We had to conserve our water, look at ways to use the water with regards to force and motion, and so much more. It was a great way to wrap up the grading period, and as a collective decision, we decided week 9 of every grading period would be a free choice to go back and work on any of the above mentioned apps! I think I can say that Cat Physics won out as crowd favorite, but Lego Creator Island and Pic Collage were not far behind! So much learning happened for all of us in the first 9 weeks of Tab Lab! Lastly, let me say it takes a village! I can’t say enough how much my partner in crime Mrs. Bates has made this a success. She is amazing in every way, and not only do the kids love learning with her, she pushes me to think even deeper about what I plan so that I can in turn help her understand how to instructionally communicate it to kids! Having someone like her to co-teach with is a win in my book every day! Thank you Mrs. Bates!! Look out 15-16… Here We Come! Where does summer go? It flies, that is for certain, but let’s face it, it makes us appreciate every moment and use the time to decompress and get ready to make the next year even better than the one before! As for me, I have spent as much time as possible just taking in the non-techy moments, and while that is sometimes hard to do, I gave it a good shot. 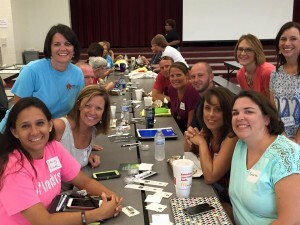 Now it is time to get back into the swing of things, as here in Georgia we teachers head back in two short days! 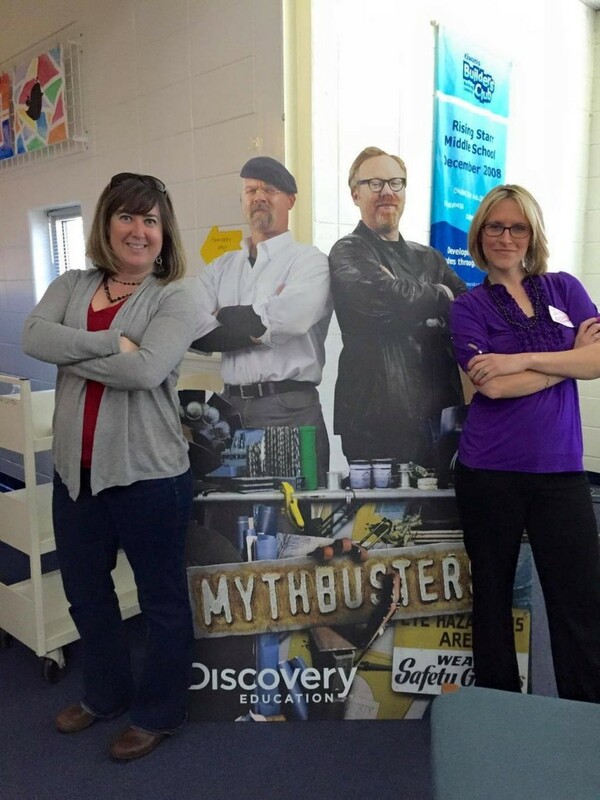 #EdCampFayette sure did get me back into the moment last week at Sara Harp Minter. I loved hosting this great event at our school, and I loved watching so many of us there learning and sharing! I had a blast seeing so many like-minded educators jumping in and truly discovering new ways to take their instruction to the next level! I had so much fun sharing Google Cardboard, and it was so exciting to introduce virtual reality using something as simple as Cardboard with other educators. I noticed that no matter who was experiencing Cardboard, they were smiling. It was an excitement about potential, about opportunity, and about possibility. We discussed the variety of ways we could use Cardboard for instructional purposes, and I think it is safe to say that won’t be the last time we think instructionally about virtual reality! I can’t wait to see what opportunities arise as Cardboard becomes more utilized! As the time has come to set my sights on the year to come, yes Google Cardboard is on the agenda, as are many other new ideas swirling in my head! 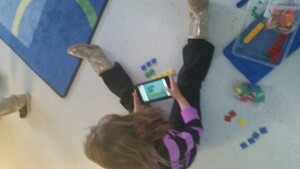 I am also excited about the learning potential in some new ideas I have in K, 1, and 2 using tablets for 1:1 instruction. I have professional learning goals, collaboration goals, relationship goals, and instructional goals. I have goals for my school relationships, and goals for our district relationships. I feel like we made so much progress last year, I simply must keep that momentum going! I want to continue to build on the dynamic culture around instructional technology, and look for ways to foster other leaders in this journey. For when we see our role in technology as one that fosters growth in learning and in people, we get to watch all of that blossom, while seeing others take the lead. This doesn’t make me less needed, rather it gives me the opportunity to learn new things, and take other leaps in technology based instruction. So as you embark on your year, I hope you set goals, dream big, and never stop inspiring! 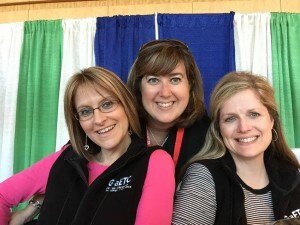 Moving to Georgia three years ago gave me an opportunity to meet new people, make new connections, and build great relationships in instructional technology. While I would have loved to report every relationship was a match made in heaven, I think we all know that isn’t realistic. I had a lot of great learning experiences when it came to trusting people, working with and for people, and finding a balance between partnerships and competition. 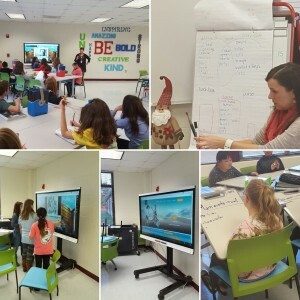 After all of those lessons I have a few ideas of what real #EdTech relationships should be… and thanks to Amy Pietrowski I can tell you for certain they are attainable with the right mindset. Amy leaves me this next school year, and blesses Maryland schools with her passion, but from our days as collaborators I can tell you for certain the recipe for true success. 1. Encourage each other – It wasn’t about how well Amy did something… or I did something.. it was about how we encouraged each other to go for it. We held the same role at two different elementary schools just minutes from each other, but we weren’t worried about who was doing what. We encouraged each other to just go in each day and make a difference! Having no true team in this school based role, we were each others ‘team’. By 7:20 am I had a “good morning from the bus loop, have a great day” message. Encouragement makes every day better! 2. Be real- My frustrations… they were heard. I knew if I needed someone to just listen, Amy wasn’t going to do anything but take in what I was telling her and give me her best advice. I tried to always do that in return. Never was it a weakness, but an understanding that there would be success and there would be failure. We always celebrated the successes, and tried to do the same with the failures. When you are real, you show the most human part of this experience. This career is full of ups and downs, but having someone you don’t have to sugar coat things for is crucial. 3. Competition is never allowed! When I took the job down the road from Amy last year, what did she do? She helped me.. every.single.day! 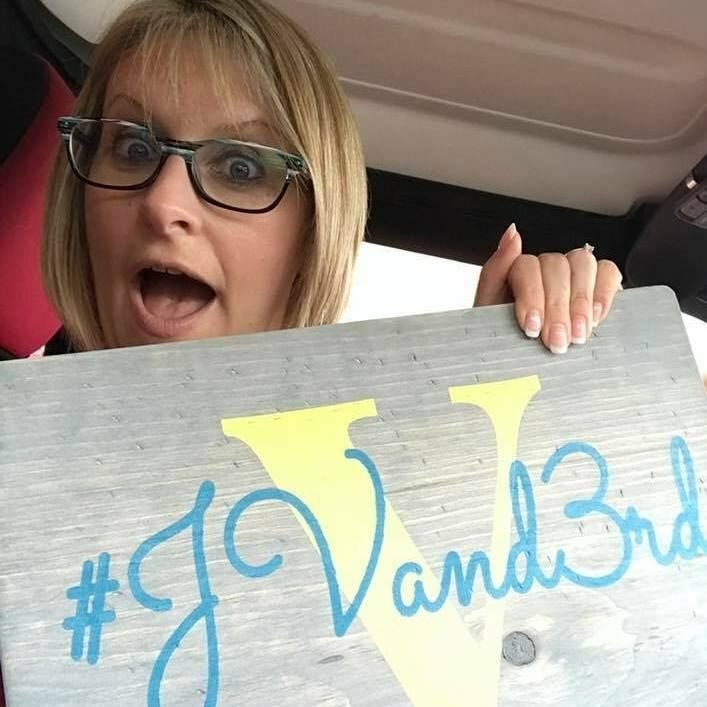 Yes I know instructional technology, but what I didn’t know was all the crazy little ins and outs of how that was going to work in a new school, in a new district. When I had a great idea… she built on it… When she had a great idea, I ran with it. We always gave each other credit, where credit was due, and we never ever wanted to see the other fail. We were a team. We voxed daily, shared ideas, and never once wanted to be better than the other. I promoted her ideas, and she promoted mine! Competition has never once been a part of our relationship, and that is why we were successful, without a doubt! 4. Do it together, even when you see it differently- Our brains work so differently that it is almost hilarious to watch. Give us the same task, and you will see two very different interpretations of the same task. We fed off each other’s passions, then went our own way with implementing it. 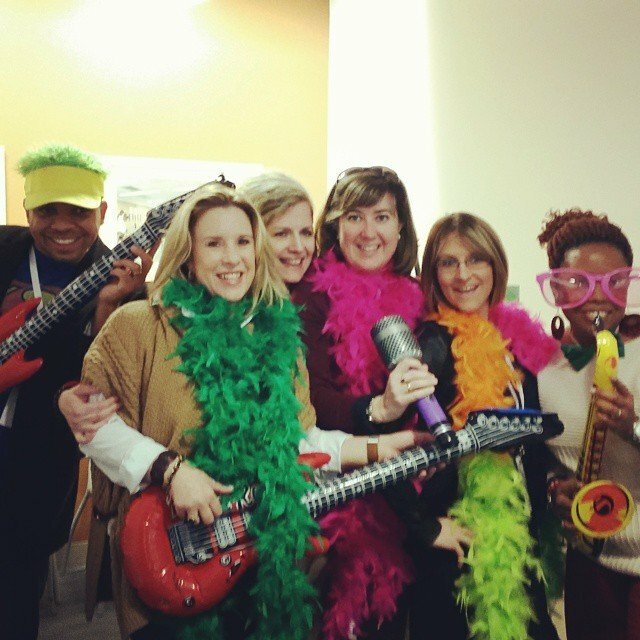 We built an idea, an instructional plan, and then we each took our own path. Reporting back what we accomplished was amazing, and led only to our next big instructional mission. You don’t have to see things the same way to be a team, you just have to appreciate each other’s differences. 5. Inspire each other to keep growing – No matter where we went, we were likely not heading to the same sessions or meeting spots. 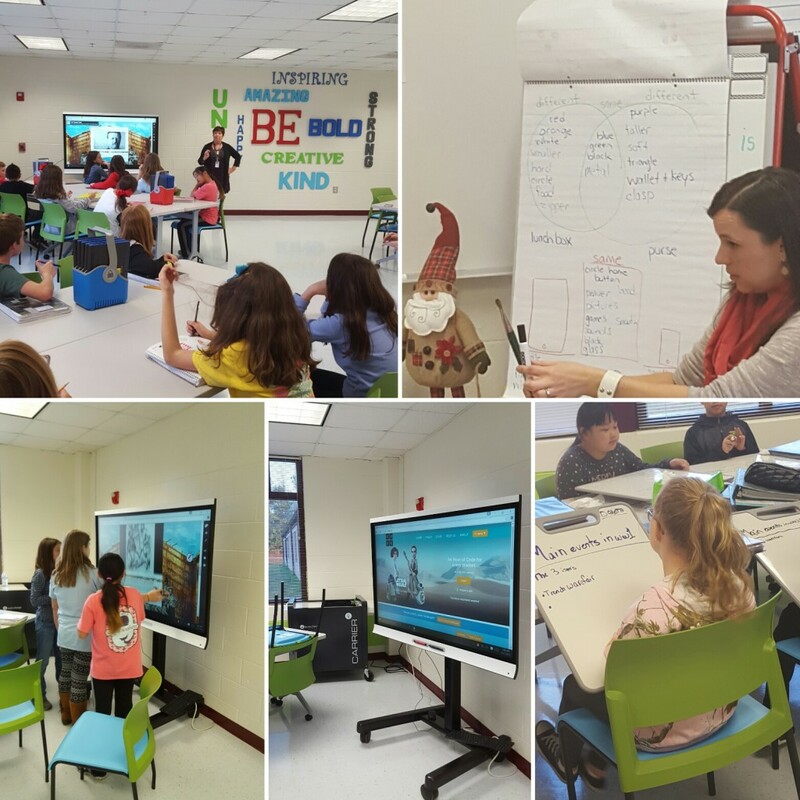 We didn’t have to sit side by side in our edtech adventures, rather we gained much more when we headed different directions and reported back what great ideas we discovered. We didn’t hold each other back, expect each other to be our tag along at a conference, or expect one another to be front row when one of us was presenting. Instead we encouraged each other to go off and learn something new. We grew far more from that, than just sitting together at every event! 6. Use your experience to help others- While this chapter of our relationship closes, another will open. 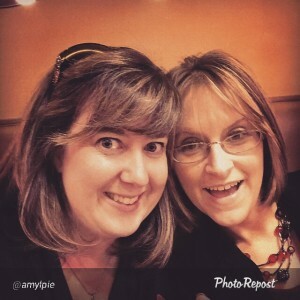 While Amy won’t be down the road from me, she will only be a vox away! What I carry away from our collaborations will be used to make more relationships this strong. I look forward to reaching out to others in this role, and using this recipe for success to help our district grow in instructional technology based leadership. Amy will go on and do the same. She will carry this to her next school and district, and the ripple effect will exist, change will happen, relationships will be fostered. So to sum it up… be there, don’t compete, value each other’s ideas, listen, encourage, share, and celebrate. It is the recipe for instructional technology success, that when used can create dynamic change in our schools. It is worth a try, don’t you think? It has been a while. Indeed, finishing an EdS in Instructional Technology and Media, while working full time and trying to keep up with life, just didn’t leave much blogging time. So with the EdS behind me… and only one class left to help me earn that Instructional Technology Certificate, I am embarking on a summer of reflection and planning for what is to come. I am excited to share the past, and provide a glimpse of the future with you! This time last year, quite honestly, I was frustrated. 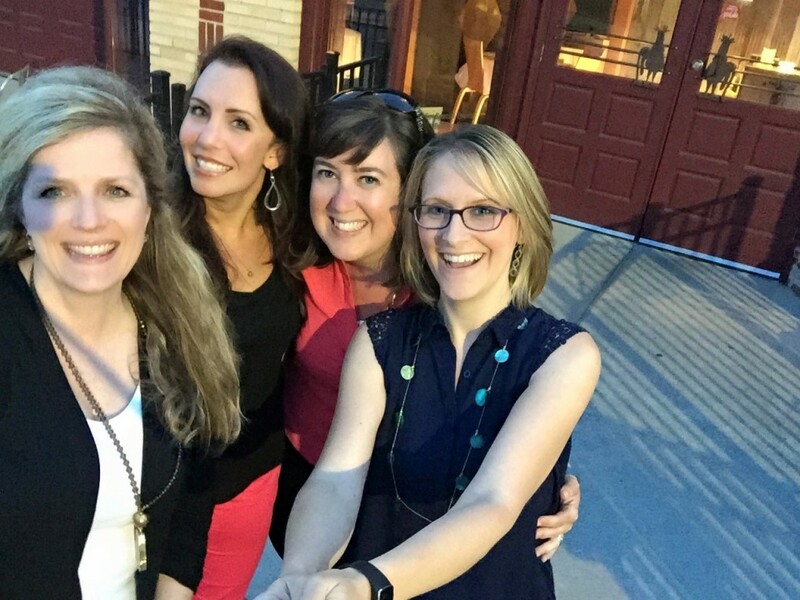 After two years in Georgia consulting, I felt like I was spinning my wheels and just never really creating change. I never had time to build relationships, I never had time to collaborate with a teacher and see the growth potential happen. I just felt lost in a field that I truly loved. Yes, I met great people, and had some small victories, but at the end of the day, I wasn’t feeling like I really made any real difference. Last July, things changed, opportunities arose, and I found myself going back to elementary school after a two year hiatus. It was a risk… as I moved my kids with me, and just hoped that I was making the right decision. Today, I can tell you you it was the best decision I could have ever made. Sara Harp Minter Elementary is a school that is filled with passionate teachers, wonderful students and families, and leadership that you just do not find in most elementary schools. I found myself with teachers who embraced change, students who thrived in a very different learning environment, and administrators who supported every crazy idea that I came up with. 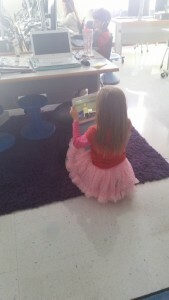 If that isn’t an #eduwin I just do not know what is! And… that is just a taste of what I was lucky enough to be a part of this year. To say in retrospect it was an tremendous growth year is simply and understatement. While I had some small part in these things, these teachers took on so many new learning experiences, and our students truly benefited! So what is to come? Well, I could write a whole blog on just that! This summer I will embark on creating our instructional technology curriculum. 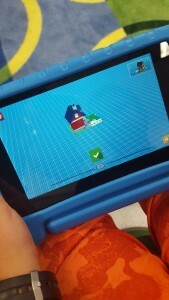 Kindergarten and 2nd grade are going to get an extra technology class weekly, and to say I see amazing potential in this, is an understatement. With that, I feel a strong responsibility to make sure the scope and sequence of what we are doing is setting us up for amazing technology integration growth. So stay tuned, as sometime this summer I will be looking for feedback! Wishing you a happy and learning filled summer!